The following are findings from a national survey of 1,500 Canadian adults conducted by Abacus Data and commissioned by EY. In the federal election last fall, voters wanted change in Ottawa, and judging from the reactions to the first federal budget delivered by Finance Minister Bill Morneau, many believe that’s what they got. 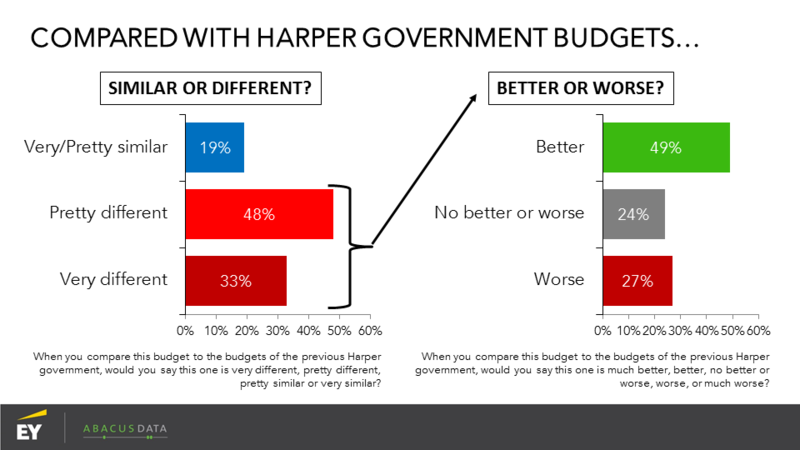 74% had some familiarity with the budget, and of them, 81% said it was different from those delivered by Stephen Harper’s government. Among those who saw a difference, 49% said it was an improvement, compared to only 27% who said it was a change for the worse. Asked how they would vote on this budget if they were a Member of Parliament, 51% would support the budget, compared to 34% who would oppose. Our survey was conducted over two days, and the proportion who say they would vote “yes” increased from 48% on Tuesday evening to 60% among the Wednesday morning sample. 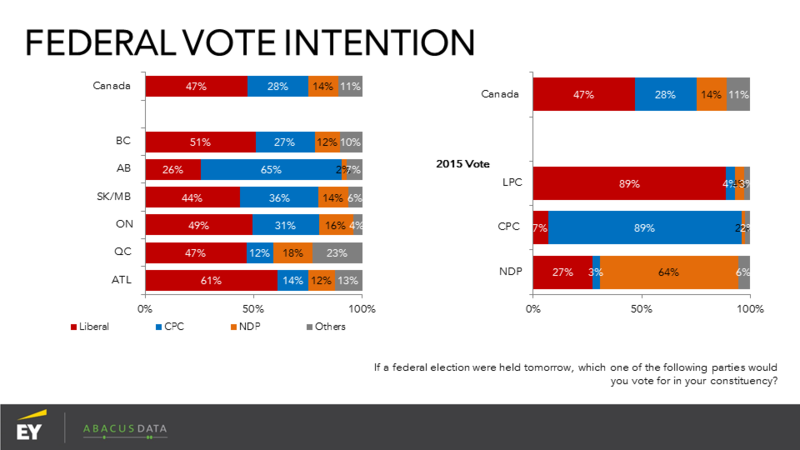 The majority of Liberal and NDP voters would pass the budget while 70% of Conservative voters would vote no. The generally positive response to the budget was based on a mixture of feelings. 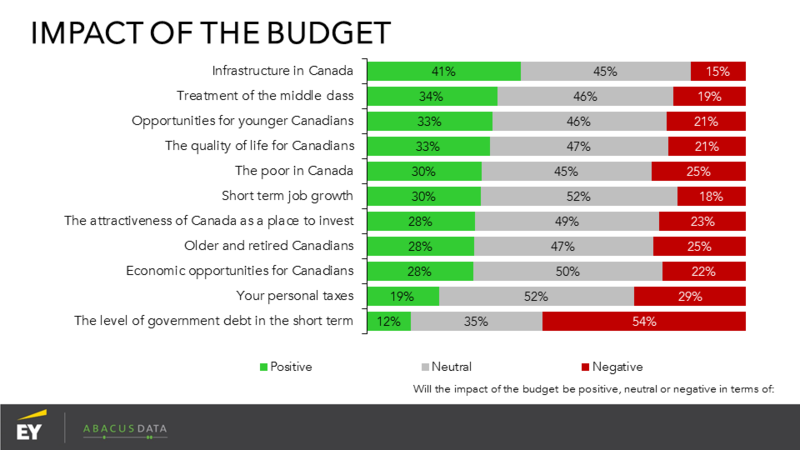 While 54% said it would have a negative impact on the country’s indebtedness, there were positive feelings about how the budget would impact infrastructure, the middle class, and opportunities for young Canadians. 30% said it would be good for short term job growth, compared to 18% who said it would be bad. 19% said it would be good for their tax levels, while 29% said it would be bad. We described 11 of the measures in the budget and asked people for their reactions. On all 11, majorities said they found the choices the government made acceptable or better. 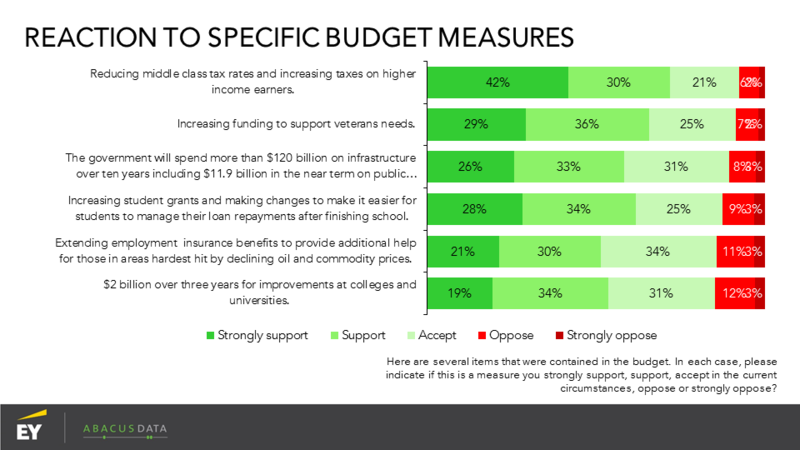 Most popular were steps to reduce taxes for the middle class while hiking them on higher earners, increasing funding for veterans, putting money into infrastructure and greater support for students. 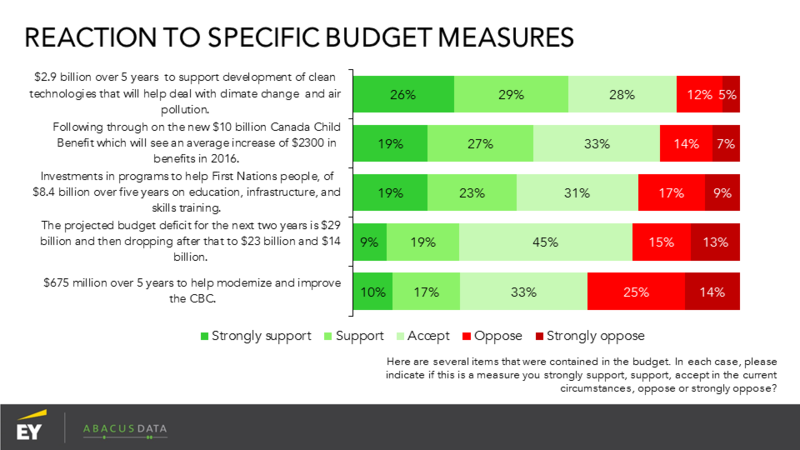 The least popular item was the provision of $675 Million to the CBC over 5 years. We noted that the government announced the deficit would be $29 billion for each of the next two years, dropping to $23 billion, and then $14 billion. 28% said they supported this decision by the government to expand the deficit, 45% said they could accept it under the circumstances, while 28% were opposed. 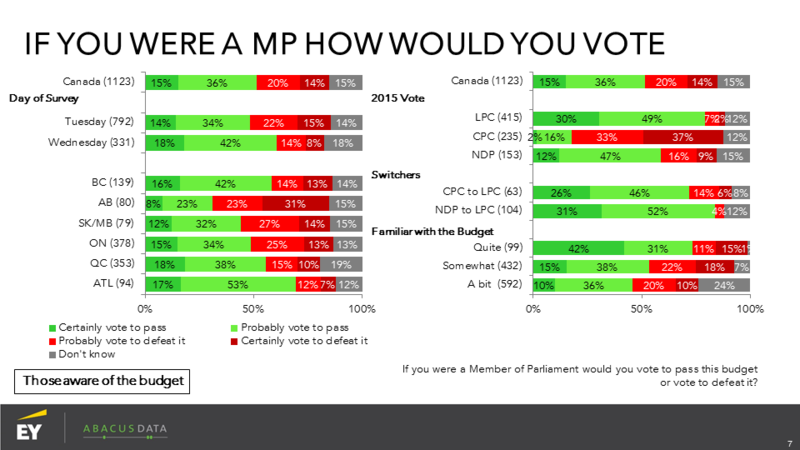 Only 12% of Liberal and 21% of NDP supporters opposed the fiscal choice that the government made. 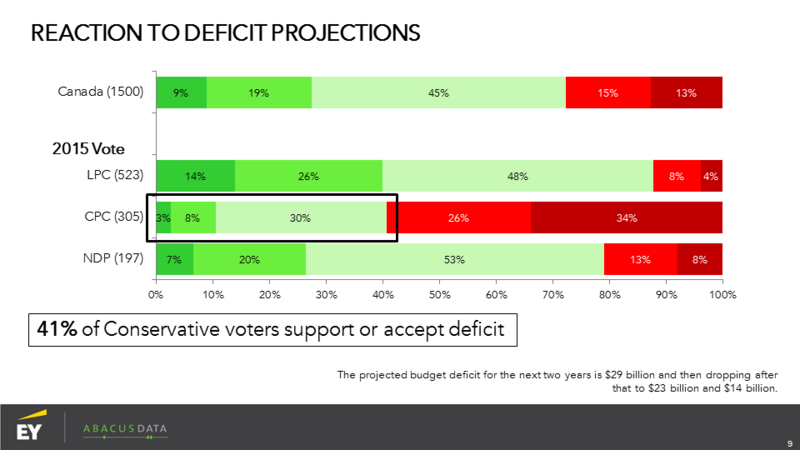 Perhaps more notable is the fact that Conservative voters were somewhat split, with 41% saying that they accepted or supported the government’s fiscal plan, and 60% opposing. 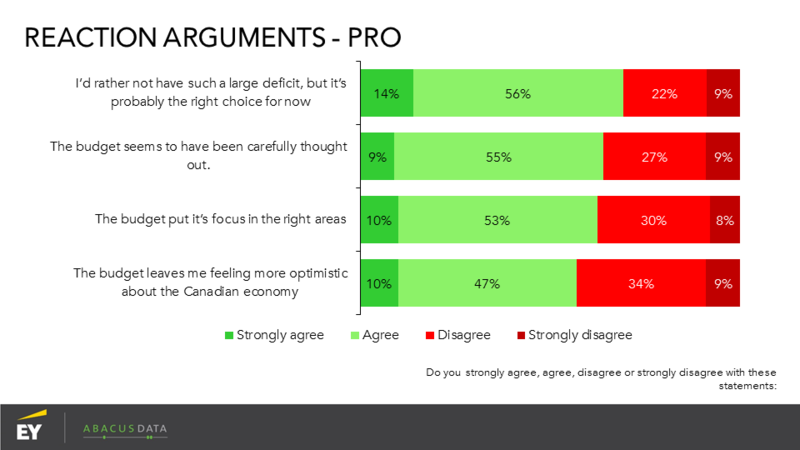 The consensus of Canadians seemed to be that while many wished the government had spent less money (67% agree), even more people felt that while they “would rather not have such a large deficit, it’s probably the right choice for now”. (70% agree). 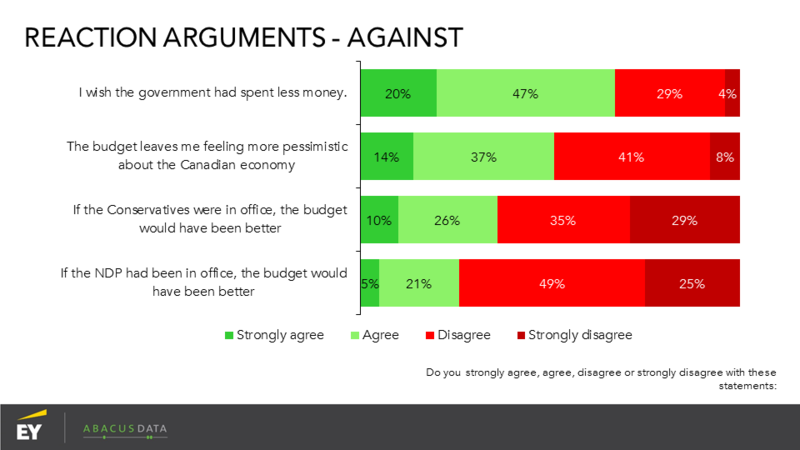 Overall, 64% said they felt that the budget seemed well thought out, 63% agreed it focuses on the right priorities, and 57% said it left them feeling more optimistic about the economy. 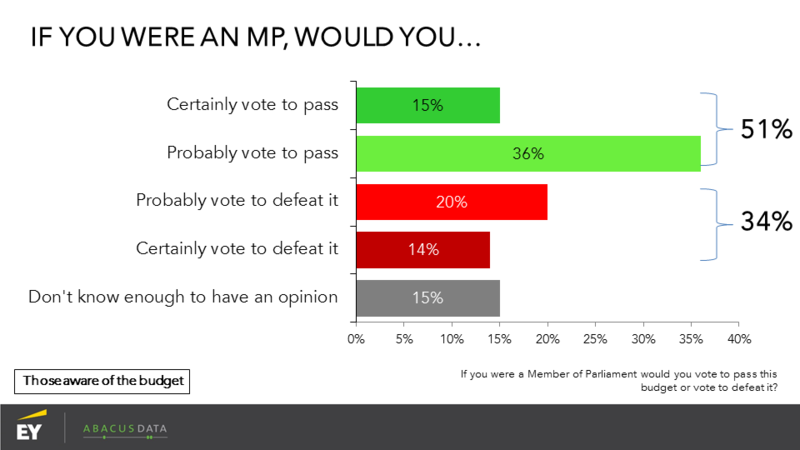 We asked people their voting intention last week, pre-budget, and again in this post budget survey. 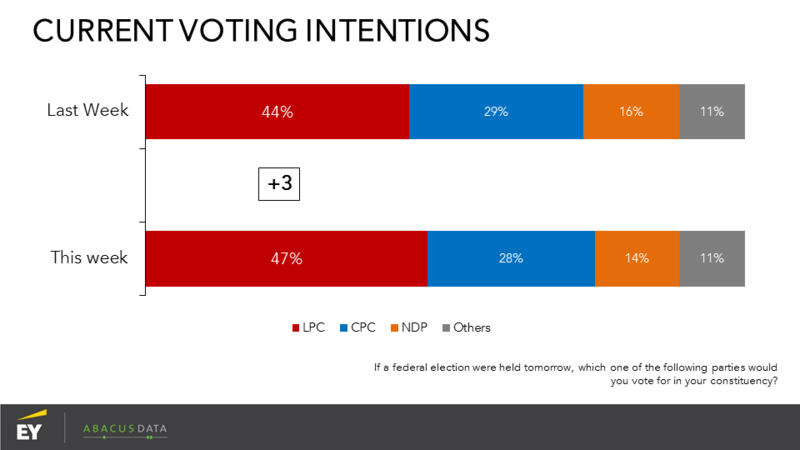 The numbers show little change, possibly a modest improvement for the Liberals. According to Abacus Chairman Bruce Anderson “Most people seem to feel they got the budget they expected from this government. They saw a shift in priorities including a focus on the middle class, infrastructure, young people and education. The deficit is larger than was promised but most have concluded that this was acceptable given the circumstances. “Canada faces big challenges and has great opportunities. The policy choices our governments make carry large consequences,” said Gary Zed, Managing Partner of EY’s Ottawa office. Our survey was conducted online with 1,500 adult Canadians from 6:30pm ET March 22 to 12:00pm ET March 23, 2016. A random sample of panelists was invited to complete the survey from a large representative panel of over 500,000 Canadians. The Marketing Research and Intelligence Association policy limits statements about margins of sampling error for most online surveys. The margin of error for a comparable probability-based random sample of the same size is +/- 2.6%, 19 times out of 20.